Thirsty for Beetlejuice? Have some beetle juice with Beetlejuice! 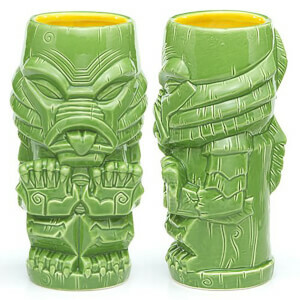 This creative and colorful drinkware combines Beetlejuice with the unique stylization seen in traditional tiki culture. This ceramic mug is even top-shelf dishwasher and microwave safe. The Beetlejuice 21 oz. Geeki Tikis Mug comes packaged in a window display box.